Learn how to use jQuery to solve some common client-side programming challenges while dealing with ASP.NET Controls. So far, we have published 102 jQuery and ASP.NET tutorials and articles, which have been read by over 9842604 (Nine Million Eight Hundred Forty Two Thousand Six Hundred Four) developers and architects. Abstract: Use jQuery to traverse all of the values in a HTML table column, convert the values to numbers, and then sum the values. Abstract: Mustache.js is a logic-less templating library, which supports the philosophy of little or no logic in your HTML templates. We will see a simple example of using this library to read a JSON file. Abstract: Checkboxes and RadioButton’s are one of the most frequently used Controls in any HTML form. This article will demonstrate how to use jQuery to perform common operations with these controls. Abstract: Using jQuery and jQuery UI, we will first bind a textbox autocomplete widget to a remote datasource. Abstract: Use jQuery to show hide columns depending on the checkbox you selected. We will also see how to show hide columns using header index. Abstract: Learn how to customize the jQuery UI Tab Widget to suit your website requirements. Abstract: Use jQuery to create a Running Counter on your website to show a countdown to an event. Abstract: Submit a form programmatically using jQuery Ajax. We will also filter empty form fields From submitting. Abstract: This article shows how to use jQuery to build a notification in your Website. You will also learn how to give your visitors the option to permanently close the notification using cookies. Abstract: Simple examples of consuming JSON and JSONP from a local and remote server, clearing some concepts along the way. Abstract: A quick look at Ajax and also explore Ajax, the jQuery way. Abstract: A quick introduction to jQuery and jQuery UI for beginners. If you are already using jQuery, use this article to foster your basic knowledge of jQuery. Abstract: This article demonstrates how to use jQuery and Globalize.js to represent a number in textbox depending on the user' culture. Abstract: Every jQuery developer must know these tips shared in this article while working on their projects and websites. Abstract: With the jQuery Boilerplate Plugin and some simple guidelines, we all can build simple to very complex and structured plugins in no time. This article shows you how to create your first jQuery plugin. Abstract: This article demonstrates how to use jQuery to move items from one multi select list to another. Abstract: In this article, we will explore how to create timer based animations using jQuery. 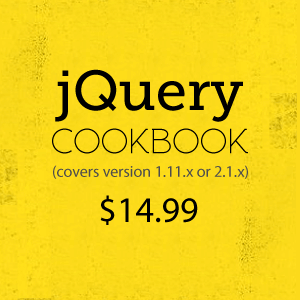 Abstract: This jQuery cookbook covers the latest jQuery v1.11.1 or 2.1 and jQuery UI 1.11.2 versions and contains 120+ practical jQuery recipes (about 70 Recipes and 50+ sub-recipes) you can use in your websites and projects right away. Each recipe includes working code, a live demo and a discussion on why and how the solution works. This eBook is available in PDF, .ePub and .mobi formats. Abstract: Use jQuery Deferred and Promise to chain multiple AJAX Requests and execute them asynchronously. Abstract: This article discusses some benefits of CDN, some fallback options, caveats and best practices to follow. Abstract: This article demonstrates how to extend the jQuery UI Accordion by creating resizable panels. Abstract: Performance Test your jQuery Selectors using the jsPerf online tool. Abstract: In this article, we will create an ASP.NET GridView which contains a Checkbox column. We will then access all the checked rows of the GridView and calculate the Sum of a column value and display it to the user. Abstract: In this simple article, we will see how to convert an ASP.NET DropDownList into Multi Select ListBox in order to select multiple items. Abstract: This article demonstrates how to apply paging in jTemplate in ASP.NET using jQuery and JSON. Abstract: In this article, we will continue with the same example and add a nested jTemplate in our ASP.NET project. Abstract: jTemplate is a template engine plug-in for jQuery and is commonly used to display tabular data by binding objects to the template. Before using jTemplate, you must know how to use the jTemplate syntax. Abstract: The ASP.NET AdRotator control is a useful control to randomly display advertisements on a webpage. However the ads in the adrotator control are rotated only when the user refreshes the page. In this article, we will use a single line of jQuery code to rotate ads using the adrotator control, at regular intervals and without refreshing the page. Abstract: In this short and simple article, we will see how to tab through the TextBoxes with the Enter Key using jQuery. Abstract: In this short and simple article, we will see how to check a condition and make a TextBox readonly at runtime using jQuery. Abstract: This article demonstrates how to use the jQuery UI AutoComplete widget to consume an ASP.NET Web Service that is JSON Serialized.